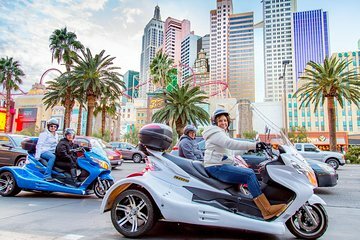 Experience the neon lights of Las Vegas like never before on this guided, 5-hour, small-group trike tour. Cruise down the Las Vegas Strip, featuring the ‘Welcome to Fabulous Las Vegas’ sign. Then see some of Fremont Street’s most fascinating attractions, like the Fremont Street Experience, Container Park, the Mob Museum and the Gold and Silver Pawn Shop featured on the hit TV show ‘Pawn Stars,’ to name a few. The use of a helmet plus select Las Vegas hotel pickup and drop-off are included. Great way to see Vegas. Tour guide was awesome! Wonderful. The guides were awesome and made sure we were safe during the trip. They had a lead guide and a van followed right behind us so traffic was blocked. We rode the Strip, went to the Shelby Museum, went to the Pawn Stars shop, Vegas sign, etc. They offered to take pictures of us at every stop, so we would have a memory of the trip. A really different way to see Vegas. First of all, the tour it’s at night, you won’t get a chance to stop much to take pictures for “safety” purposes and it seems like they had a bad experience with previous groups because the safety briefing it’s all about the terrible things that had happen to others during tours. This tour was fantastic! A cool way to get around Vegas to see the sights.. The trikes were so easy to drive, and our guide Shannon was awesome. We had a great time, and look forward to doing it again! Ive been to vegas 4 years in a row and this by far was the best time I had. The trikes were piped and super fun to ride. I even enjoyed being a passenger because you can enjoy the scenery more. Shannon who managed the tour is awesome. He took many pictures for us at all the stops. Amazing value! Totally made our trip. It was awesome and so much fun. Would do it again in a heart beat.